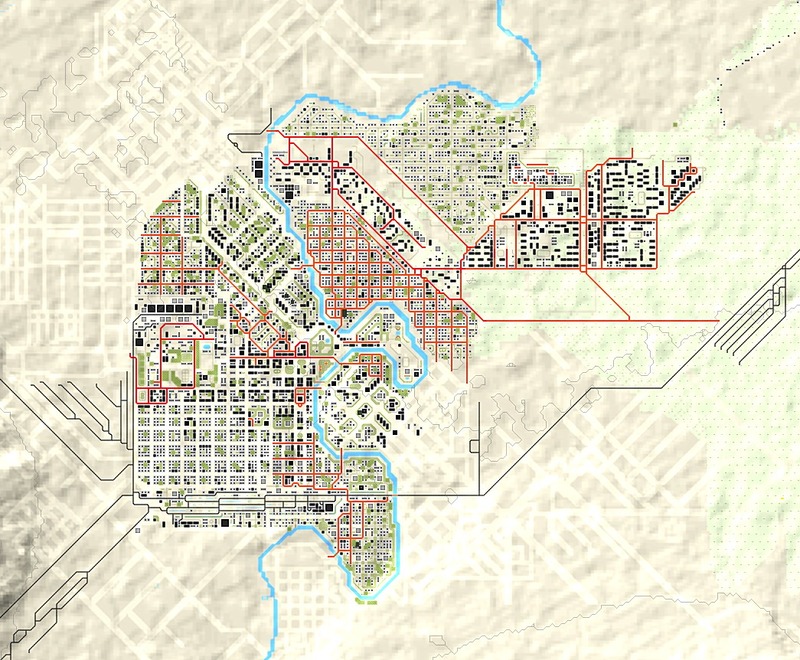 Status: offline Plugging away at central Grozny today - cities can be a pain, but I think I'm starting to get this one worked out! 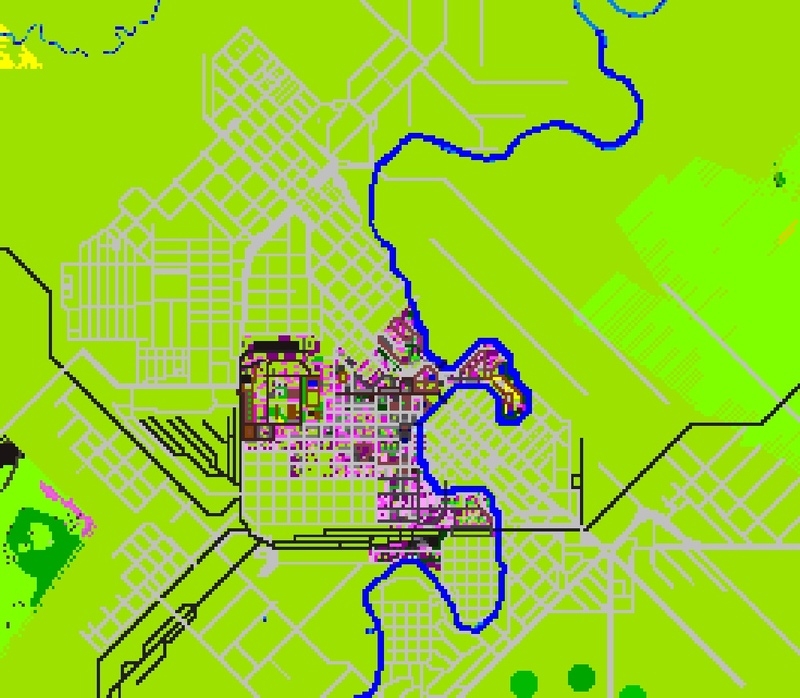 Really having to rely on the "paved" tiles rather than roads for maing most of the streets, particularly for diagonals. 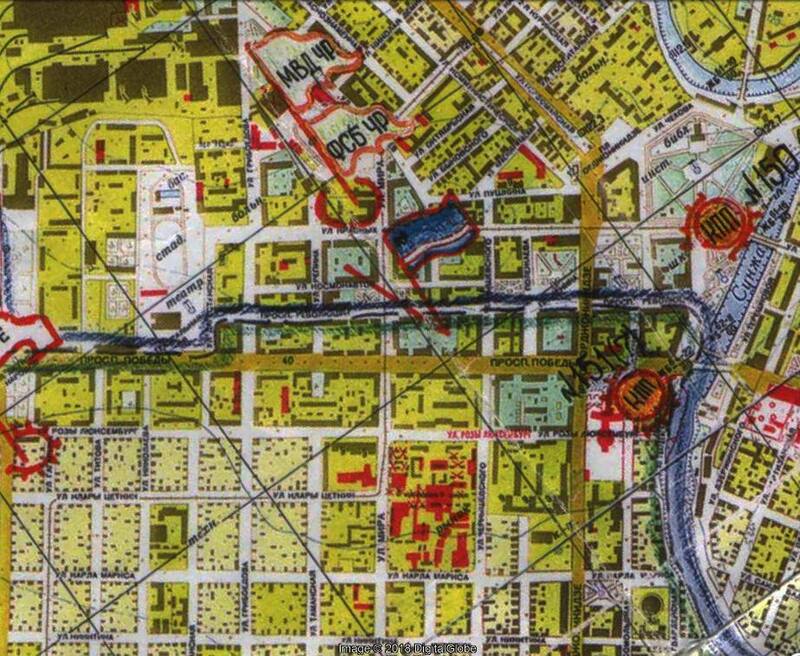 Note that the map is meant to represent the city during the 1990s, rather than as it is today. On 6 March, between 1,500 and 2,000 Chechen fighters infiltrated Grozny and launched a three-day surprise raid on the city, overrunning much of it and capturing cachés of weapons and ammunition. Also in March, the Chechen fighters attacked Samashki, where hundreds of villagers were killed. A month later, on 16 April, forces of Arab commander Ibn al-Khattab destroyed a large Russian armored column in an ambush near Shatoy, killing at least 76 soldiers; in another one, near Vedeno, at least 28 Russian troops were killed. As part of the Chechen raid, separatists attacked the slowly growing airbase at Kalinovskaya. Rumors were circulating that the Russian military was stationing the dreaded Hind attack helicopter at the airbase. On the night of March 6, 1996, the airbase was attacked by Chechen fighters. But the raid failed thanks to an alert security detachment guarding the Russian base. The raiders fell back to the east into small villages and prepared for reinforcements. In the morning, a Russian motorized rifle company was assembled to eliminate the Chechen threat just a few kilometer away. Note: At this stage, the Chechens would need to be represented by USSR infantry and Russian 1991 equipment selected to represent 1996 realities. I was always curious what became of Kalinovskaya after it got bombed right at the outset of the war, especially since it remained in separatist hands for some time - but never found much about it. And although the helicopters tended to be based out of Mozdok (just a bit further up the river), considering the methods adopted by the separatists in 1996, an attack on a Russian base even outside of Chechnya (but still in the region) would not be implausible, either! Status: offline I will put something out soon re: that scenario. Your map, with all the hard work, deserves a battle to be fought across. It can be done, just sans the thermoberic warheads. 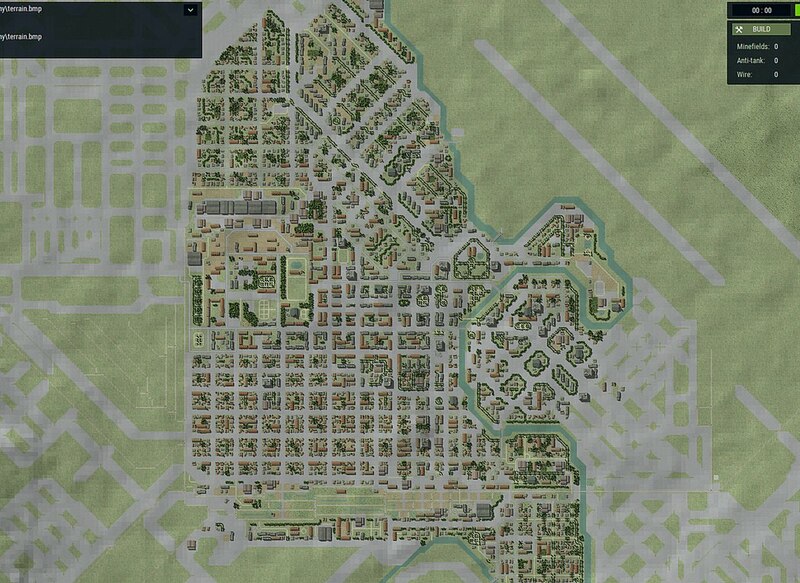 A good chunk of Central Grozny is more or less completed. This area here saw some of the most intense fighting, particularly during the initial 1994-1995 invasion. 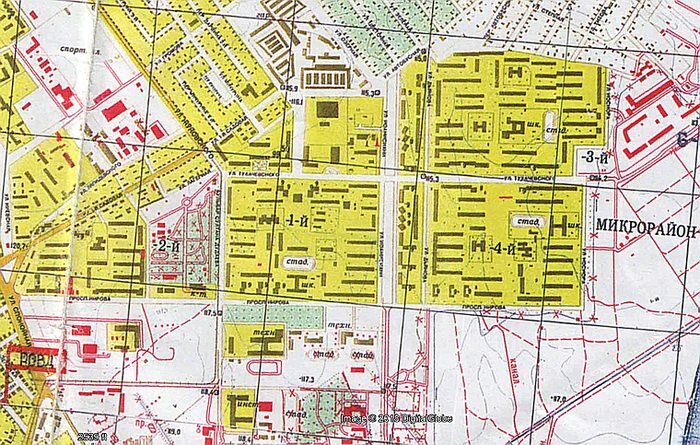 The rail station (seen here in the lower part of the map) saw some of the heaviest fighting involving armor, and it was in this area that the Northern Group (which suffered well over 50% casualties) took most of their losses. Status: online You may want to test and see how well the pathfindung and AI with this blocks before you get too far in. You may want to test and see how well the pathfindung and AI with this blocks before you get too far in. Good point! I'll give it a try later today. I am reasonably confident it'll work alright, though, since the spacing is pretty generous. The only thing that slightly worries me is the bridges and the AI's ability to get across the river, but then historically I don't believe there had been much fighting over river crossings. 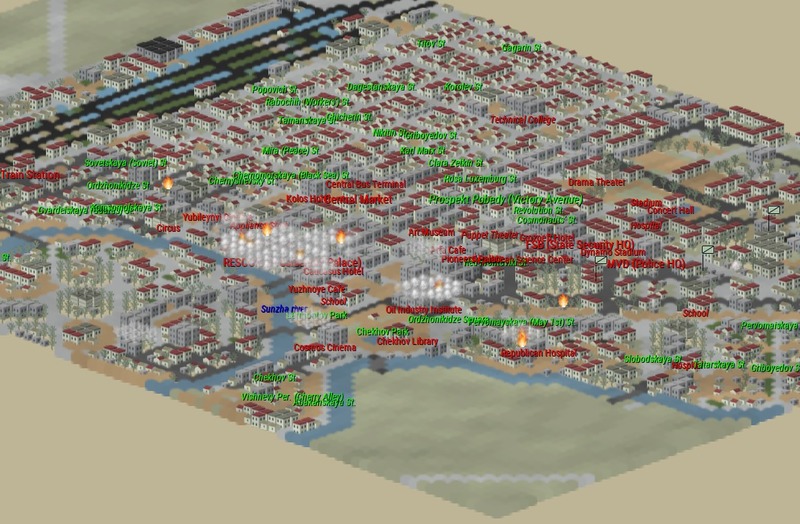 At worst, I might have to create some fordable areas! In fact it was a little eerie at times, since the progress and outcome was kind of realistic! "The Russian advance over this hastily improvised road, constructed with the aid of the most primitive facilities, was, for a time,accompanied by the strains of band music.". 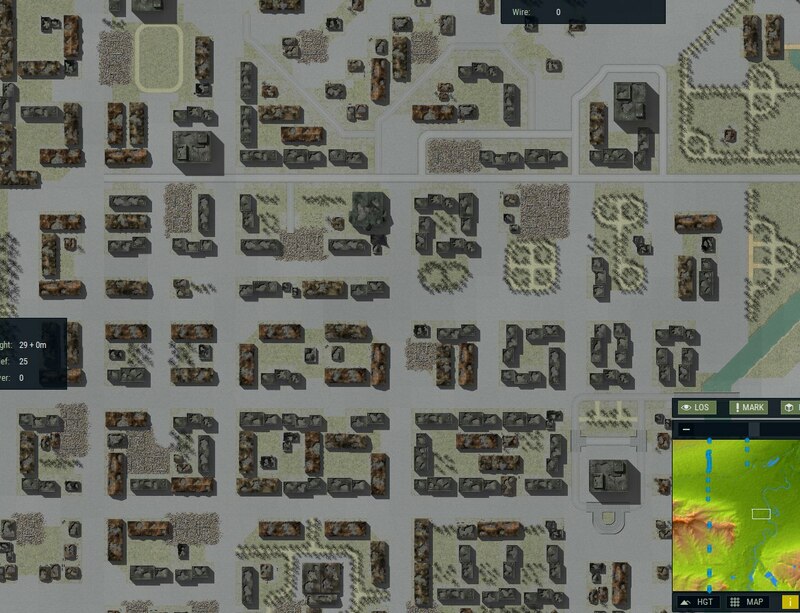 I'll have to do a bit more research on the OOB, but for the moment, I'm mainly trying to emulate the small-unit tactics used in Grozny - which centered around small but very heavily-armed teams. Status: offline Wow, I am thoroughly impressed by this! 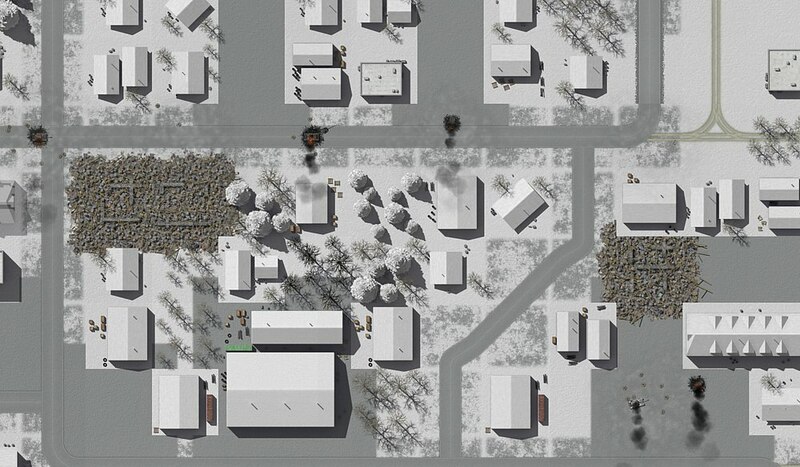 Status: offline I have a scenario made for the map but can't post it due to the crazy file size restriction. Any ideas guys? I posted a message in tech support asking to loosen the restrictions. Maybe I can email it to CCIP-subsim since he has a work around given all the lovely pics he has posted. Status: offline That might work! Just curious, do you have something like Google Drive or Dropbox (or any other similar service) account? That's usually the easiest way to get something up that's a bit bigger than forum attachments. 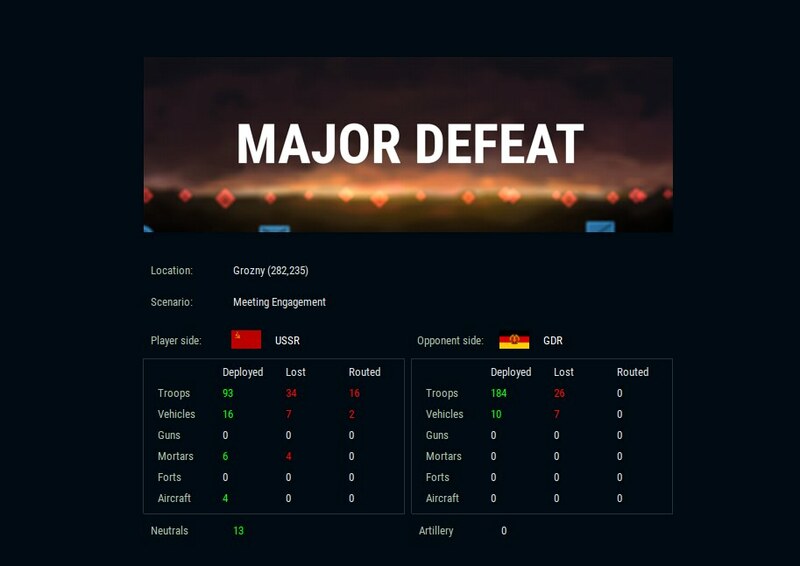 Status: offline I have drop box but have not used it since 2016 when I was working on the winter and Stalingrad mods for CM which required a lot of storage. I would rather the forum increase the size allowed so scenario files and comments are all in one place. Right now you can't post a zip file of any size. This is counterproductive. Players posting saved games will help the developer improve the game. Anyway, to get started I will try to send you the scenario via email. Please PM your address. Thanks. Status: offline Amazing man, simply amazing. Nice modeling of Chechen T-72. ...it's also getting blown up, repeatedly! Meanwhile, also working on the DB. 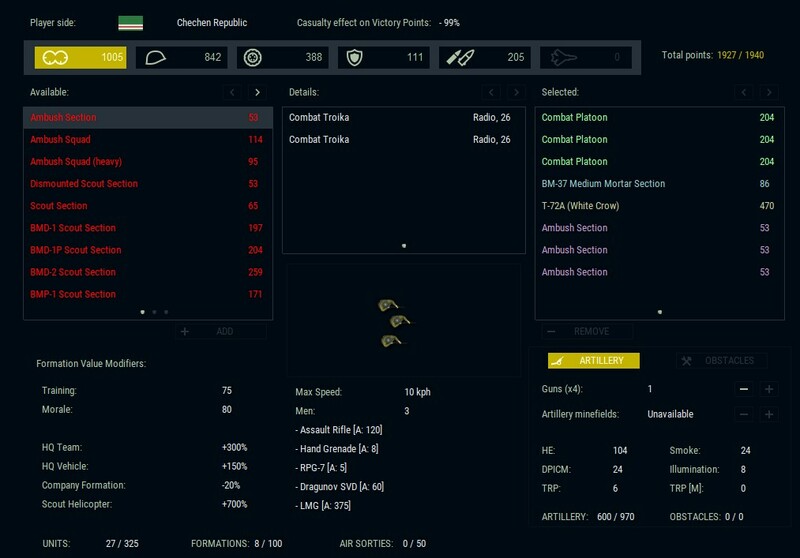 Tweaking around to try and get the combat odds a bit balanced - mostly by reducing small-unit infantry's vulnerability to direct fire, and trying to find the right loadouts (so that they're neither too ineffective nor excessively effective against larger Russian forces and their many vehicles). Status: offline Wow, looks very nice! Urban fighting in there will be a nightmare. 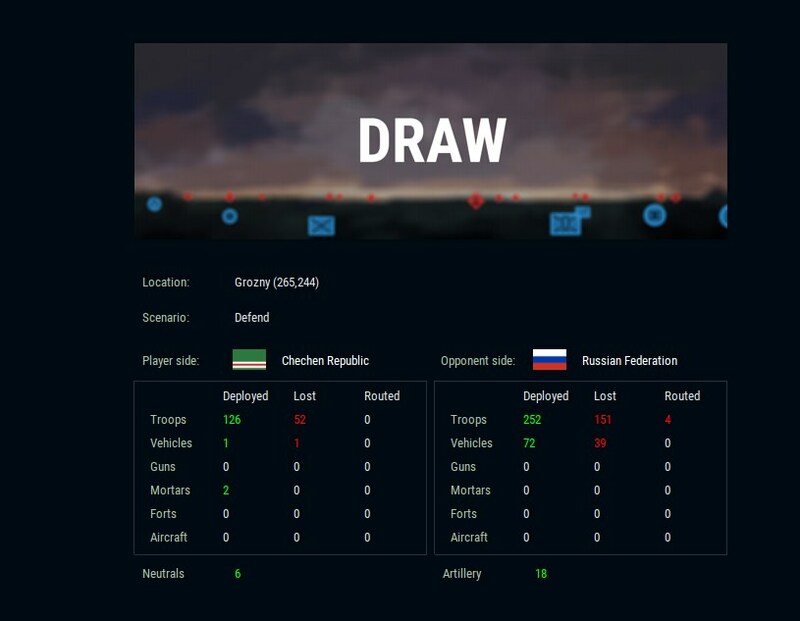 I've been plugging away at a preliminary DB - for now, Russia is just a copy of the USSR 1991, but I've redeveloped the Chechen forces from scratch to suit the scenario. It's a bit tricky because you get a very asymmetric conflict, which AB isn't particularly designed for - but if all works well, I'm hoping it can make for some interesting scenarios at least. The two Chechen factions right now are the 'Chechen Republic', modeled on the CRI armed forces prior to and during the 1994-1996 war, and the 'Chechen Opposition', modeled on the Russian-sponsored anti-Dudayev coalition during the Chechen Civil War of 1994 (i.e. the militias of opposition warlords Umar Avturkhanov, Bislan Gantamirov and Ruslan Labazanov) but which can also be used for an alternate, lower-quality opposition faction. The main difference is that the CRI faction is better trained, more focused on smaller but far heavier-armed units of better quality - while the Opposition faction is made up of lower-quality militias but with (somewhat) better availability of air, armor and mechanized support. 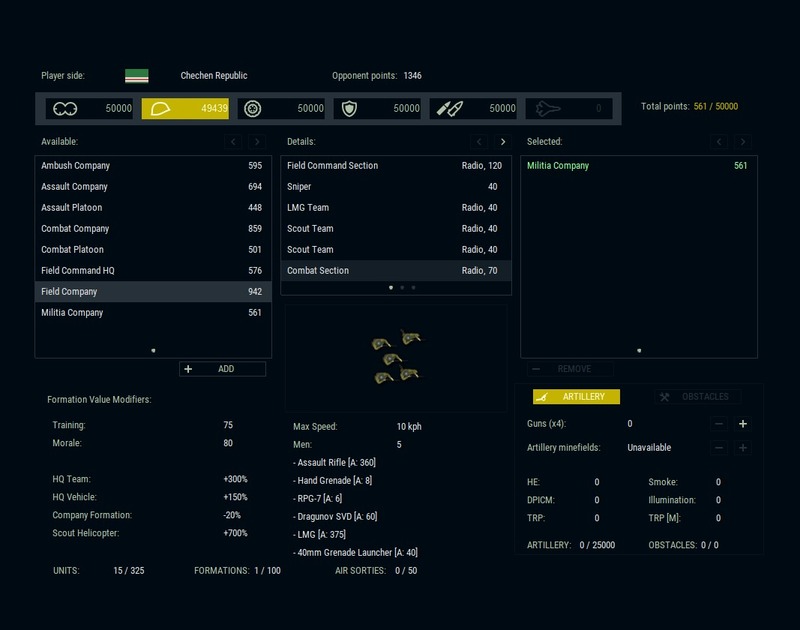 Units for the CRI especially are much more 'expensive' (in terms of game generator points) than their Russian counterparts, but are also a bit less vulnerable to direct fire and are very well-armed for their size, particularly with RPGs. The Chechen Opposition has very limited AT capabilities besides their tanks, while the majority of all Chechen Republic units carry RPGs, giving them a fighting chance against Russian forces - if they keep their cover. The odds for success in open ground for the CRI are limited, but this might make them an interesting faction to play. They lack any deployable mechanized recon units, and even their largest mech or tank formations are a whopping 2 vehicles with a maximum of 5 dismounted troops (because historically, they had only about 40 working tanks plus 40 other AFVs, BMPs and MT-LBs, and never really used them outside of ambush roles). 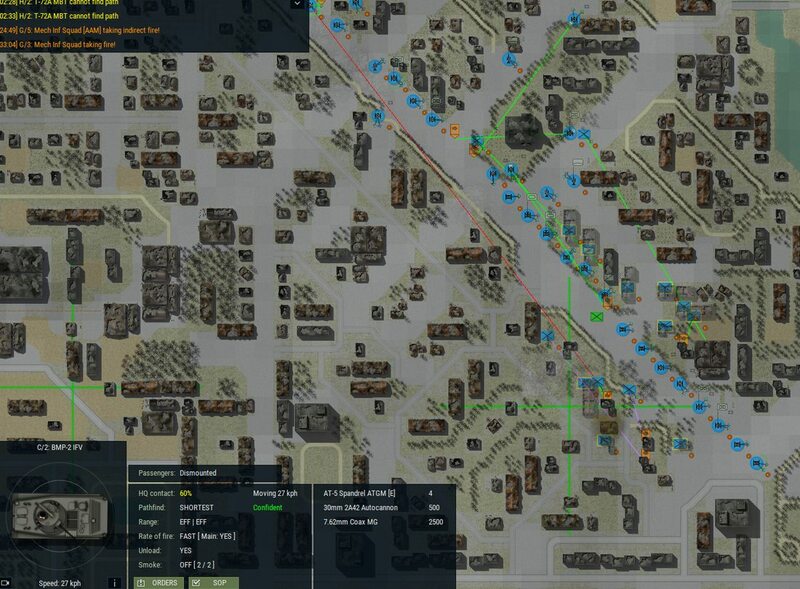 The upside, however, is that there is a large number of deployable foot recon units that go well outside the normal scope of scouting forces; they can have lots of little teams with plenty of RPGs, sniper rifles, LMGs, and other such weapons deployed in the scouting zone and as far as my testing went so far, it does create lots of headaches with ambushes for any attacking force. Still working on balancing it out, though, so it may be some time before I put up the DB for download! Scout Team (2 men) - Semi-auto rifle + SMG, with a pair of one-use RPG tubes (RPG-18). They run slightly faster than average infantry. Sniper (1 man) - VSS Vintorez plus grenades - this one is actually quite rare as even in a 'Sniper Squad' deployable formation he only appears as 1 of 9 men, and otherwise there will be only one of him in certain infantry platoons and companies. He is currently the quietest unit (his muzzle signature is the same as a 40mm grenade launcher, which is currently the quietest other infantry weapon in game), and he fires subsonic 9x39mm rounds. RPG Team (2 men) - RPG-7, currently with 6 rounds, plus two more RPG-18 tubes. SMG for defense. Combat Team (3 men) - this is the 'bread and butter' of Chechen ambushes and raids, especially in urban fighting: an RPG man (4 rounds + 2 more RPG-18 tubes) who also carries an AK rifle, an LMG man (RPK or RPD), and a sniper (SVD). Needless to say, they're very heavily armed for a unit that size - the situations where they're used, though, means that they typically wouldn't have to carry that loadout very far. Infiltration Team (4 men) - AK w/grenade launcher and SMGs, lots of grenades, 4 RPG-18 one-use tubes. Like scouts, they move slightly faster than average infantry. Much more lightly-armed than the above "Combat Team" trio, but more mobile. Scouts are deployed in various formations, but the largest of them is a 'recon platoon' of only 25 men in total. Most of the formations are squads of 8 to 12, made up of small teams. These are either specialized by role, or mixed (e.g. there is a 'support squad' made up of a Scout Team, RPG Team, LMG Team, and a Sniper Team). Combat Section (5 men) - typical infantry unit; sort of like an enlarged "Combat Team" trio, but the additional two men both carry AKs with 40mm grenade launchers, and a couple of additional RPG rounds. These are also the units that ride on the few BMPs and MT-LBs available. Smaller than the Russian 7-man mechanized infantry squads, but have similar or even slightly more firepower. Militia Section (7 men) - relatively weak infantry unit, mainly used to fill out the "Chechen Resistance" faction. Their armament is limited to a mix of AKs and semi-auto rifles, and they lack the sniper and RPG weapons of their tougher counterparts. Assault Section (9 men) - this tough unit is meant mainly for overwhelming Russian infantry in direct assaults. It's based on the "Combat Section", minus the RPG-7 (instead they only carry 4 RPG-18 single-shot tubes, so they're more limited against vehicles), plus 3 additional AKs (two with 40mm grenade launchers) and an additional LMG. Field Command Section (10 men) - field HQ, meant to represent a Chechen warlord (they were commonly referred to as "Field Commanders") and his guard. Heavily armed and tough to kill. Mainly used as HQ unit for larger formations. Infantry is deployed in various formations, platoon size and above. The largest is a 'Field Company' of about 90 men. MT-LB(w/ 7.62mm MG) - APC, deployable either as HQ or as a section (2x), each with a 5-man Combat Section aboard. BMP-1 and BMP-2 - no ATGMs carried on either (these had been removed for use from fixed cover during the conflict), also deployable either as HQ or as a 2-vehicle section with 5-man infantry sections on board. As with all CRI armored vehicles, they can be distinguished by their white-painted turret. BTR-70, BTR-80, BMP-1, BMP-2 - deployable as HQ or as 4-vehicle platoons, in the latter case each with a 7-man militia section on board. No ATGMs on the BMPs. T-62 and T-72A - both deployable either as HQ, or as a 2-tank section. Both are good-quality units, but their numbers are limited (thus cost is high) - the CRI forces were thought to have around 40 working tanks at the start of the conflict. Distinguished by their white turret (on a standard green hull), dubbed ‘White Crows’ by Russian forces. T-62 and T-72 - HQs or 3-tank platoons. These were provided to the anti-Dudayev opposition in 1994, without markings and crewed (either mainly, or even exclusively) by Russian ‘volunteers’. As a result, they have better training than the average for the faction. Historically, these are not thought to have operated together - the opposition had a few T-62s, the last of which they lost during the aborted attack on Grozny in October 1994; while the 40 or so T-72s were brought in for the attempted (and ultimately disastrous) assault attempt in November 1994. HMG - standard DShK HMG team. GMG - AGS-17 grenade launcher team. Made these mobile (by default in AB, these do not seem to be capable of moving - but in the Chechen context, these were commonly used on offensive raids. They had quite a large number of these launchers). MT-LB AA (12.7mm DShK) - I have seen reports of Chechen MT-LBs with this or even larger AA weapons. This one can only be deployed as a single vehicle. 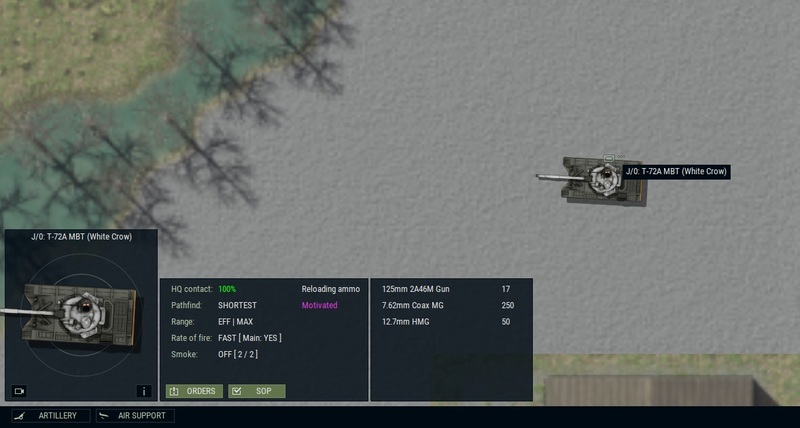 Artillery: available in batteries of 4; noticeably more ‘expensive’ and with less ammo than standard Soviet artillery. Air: during the First Chechen War, the CRI aviation played no role - as it was destroyed by Russian bombers on the ground 2 weeks before the actual invasion. However, I’ve included it as it was just prior to that - and they did carry out a small number of sorties during the Civil War phase earlier in 1994. 1x MiG-17, loaded with iron bombs (Chechens had 2 MiG-17s and 1 MiG-15 at Kalinovskaya prior to the war. Whether or not they were ever actually operational is unclear). Air: during the Chechen Civil War, air support was covertly provided by unmarked Russia Air Force aircraft, operating from Mozdok air base. Both sides appeared to humorously refer to them as ‘UFOs’ as Russia vehemently denied that any of their aircraft were over Chechnya prior to December 1994. Status: offline This mod will be glorious. 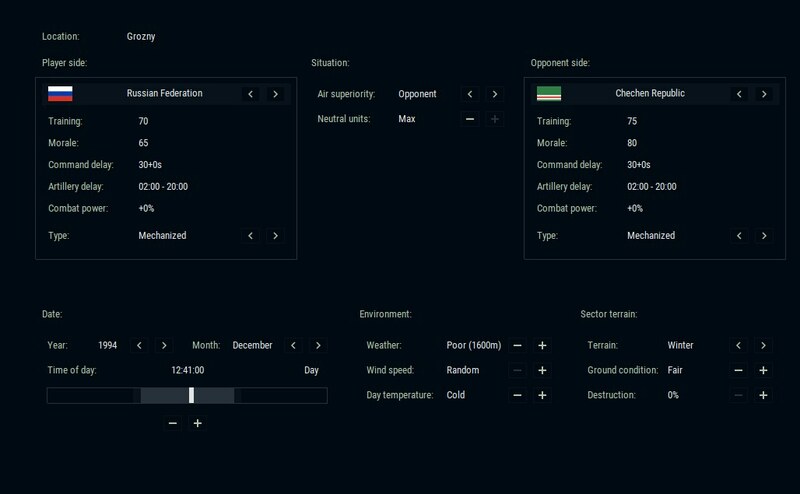 Is this mod will be a single year time frame game? 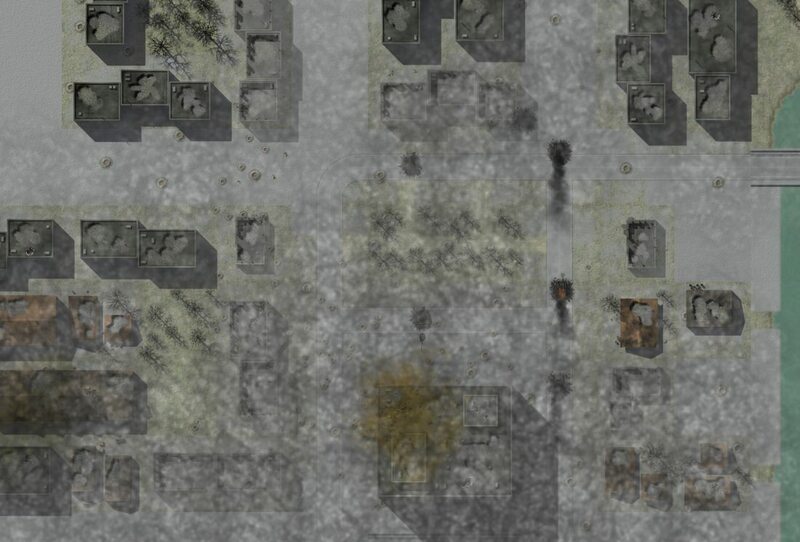 Actually I like where it's going, but I need a bit more time to tidy it up - so most likely, I will release a first test version of it together with my completed Grozny "mini-map" in about a week or two. There are a bunch of subtle balancing things I'm doing with the factions and units for this particular scenario, and I want to be able to test them a bit first, without breaking the rest of the game while I'm at it! Status: offline Today's mapping progress: have laid out 3 areas on the east bank of the Sunzha river, each with their own unique character - an older town district closer to city center, an area full of small cottages in the north, and a series of so-called "microdistricts" (Soviet-style high-rise housing blocks) between tehm and further to the east. This area had been one of those least damaged during the war in the 1990s (relatively speaking). 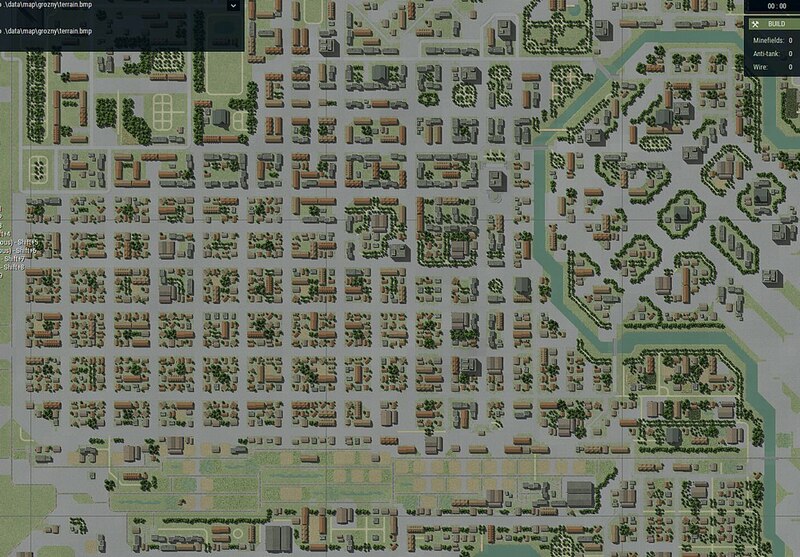 Again, with the (WIP) layout of the in-game "microdistricts", vs. the historical map source. 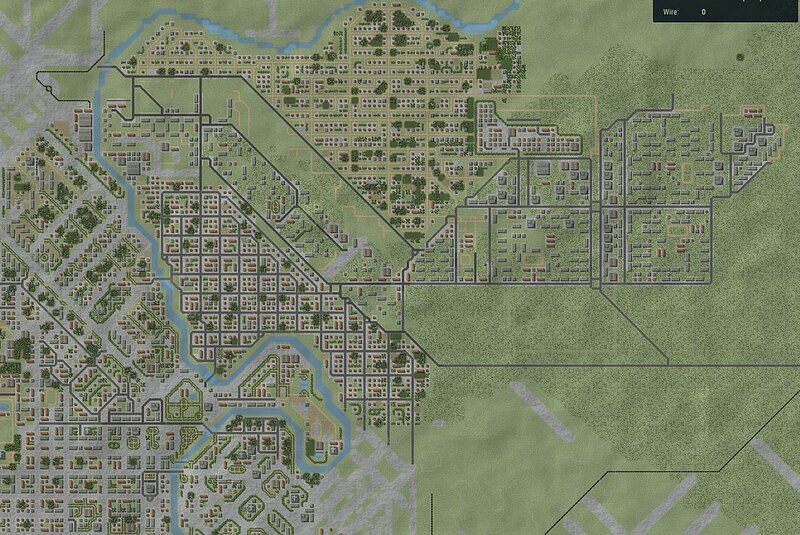 It's not 100% precise, and I chose to stick to a pure horizontal/vertical layout for the nearby areas as well rather than tilting it (mainly to preserve lines of sight on those cottage lanes). 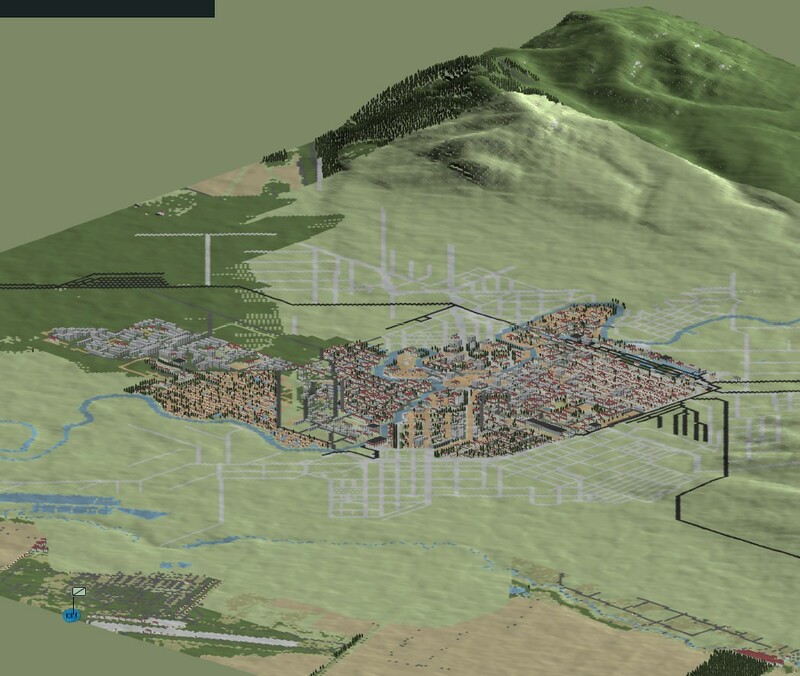 The high-rise area also ended up slightly larger than it is in real life as I wanted to keep the buildings realistically separated (but can only move them apart in 30m increments with the map scale). Status: offline I've been watching for a while this is amazing I can't wait ! Status: offline Wow, good job, looks amazing. 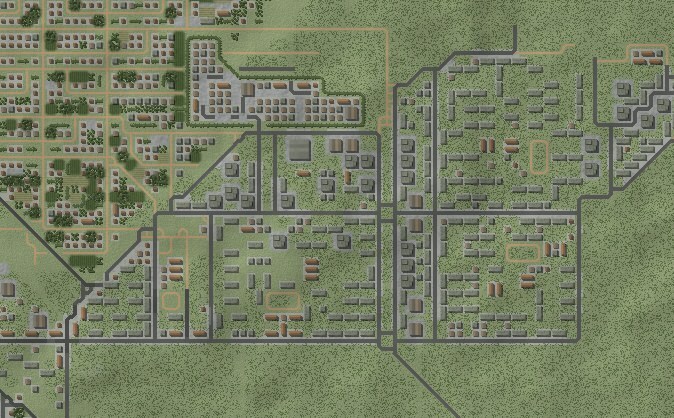 Status: online I don't recommend making city blocks that are surrounded by buildings, with plain terrain or such in the center. Those can be traps for vehicles, especially for the AI side. Long lines of buildings should be avoided, because they too can become traps for moving vehicles. It looks like you've followed this convention quite well.